At Langstone Cliff, we always look forward to our own family breaks in Devon! Rejoice for the summer holidays – they’re the highlight of every child’s year and we know how important it is to spend quality time with your family when you have the chance. As one of the best places to stay in Dawlish, we’re happy to welcome families of all ages. That’s why we pride ourselves on offering plenty of family rooms where two children under 10 can stay absolutely free of charge – that’s right, accommodation and meals! We always make sure that we have something going on for our residents and non-residents here at Langstone Cliff that’s why we have invited Alan Austin to our stage for one the biggest childrens parties in Devon. 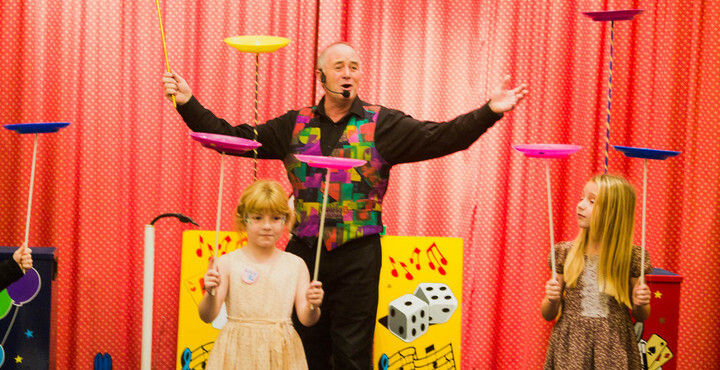 Party entertainer and magician, Alan has over 30 years experience and his parties offer variety and excitement. From magic shows to junior discos, balloon modelling to plate spinning there is something for everyone! You can catch Alan every Tuesday from 31st July until the 28th August.